The hunger strike by 29 Kurdish political prisoners in protest to merging violent criminals with the peaceful activists started on 20th of November. In response, and to end the hunger strike, the Iranian regime threatened further penalties, including the threat of the death penalty, or to redistribute the prisoners to separate and isolated prisons in order to break the will and psychology of the activists. As the situation in Şengal and Kobanê demonstrates, Kurdish unity and nationalism is at an all-time high, with the resulting response to the plight of the political prisoners in Urmiye being unilateral and unequivocal support in the diaspora. Further, the collective Kurdish response strongly, and in no uncertain terms, condemned the treatment of the prisoners and the further policies of the Iranian regime to break the prisoners will. As a result, across both Europe and Greater Kurdistan a number of demonstrations occurred as protest against the Iranian regime’s inhumane treatment of the prisoners, as well as to support the activist’s basic demands. The protests and demonstrations acted as sites of further information sharing about the plight of the prisoners, as well as the health and well-being of the prisoners. On December 14 the committee of PJAK in Stockholm the capital of Sweden initiate a demonstration to protest the Iranian regime, in supporting the Kurdish political prisoners in central prison of Urmiye which they hunger strike for more than 28 days to meet their allegation in prison. Hundreds Kurds and the nationalities of Iran join the demonstration to protest republic Islamic of Iran. The Iranian opposition, PJAK, party free life of Kurdistan, democratic union party of(PYD),kurdistan human rights association, the platform of freedom and democracy for Kurdistan Komala Jinani Amara (KMMK),the youth platform of zagros, movement the liberation of al Ahwaz, Balochistan Nationality Party, Baloch human rights council, were participated in the demonstration to protest the Iranian regime. At the last, Kurdish singer (Kale Ateshin) sang an anthem for the political Kurdish prisoner in central prison of Urmiye. 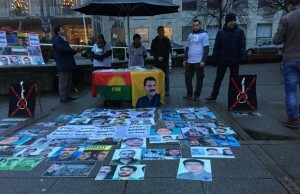 From December 16 to December 19, at the Sergel’s Square in down town of Stockholm, the Kurdish activist had strike to support the political Kurdish prisoners. During this time our Kurdish friends and our people coming for sympathy with us and to support political prisoners. Also there were another Kurdish hunger strike in Karlstad city in Sweden, from December 17 to 19 to support the Kurdish political prisoners and break the silent of the human rights organization and governments and became the voice of these prisoners. Regarding the Kurdish political prisoner, coordinators giveaway some notes and collects the signature from members who participated. At the end of hunger strike on December 19, hundreds of Kurdish and Iranian nationalities gathered by the Iran embassy in Stockholm and protest the regime. On December 21, another demonstration took place at the Arlanda Sweden airport by the Kurdish people and also protests the Iran regime tragedy on the central prison of Urmiye. 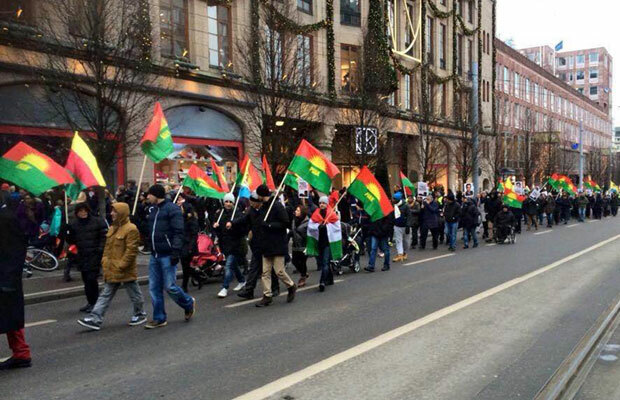 A protest led and organized by PJAK also took place on the 14th of December in Helsinki, Finland. 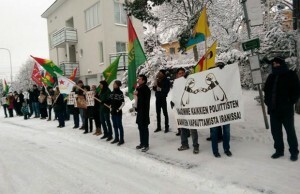 Hundreds of Kurds from across Finland as well as sympathisers, human rights activists, civil rights organizations from Iran participated in the protest in solidarity with the plight of the political prisoners in Urmyie. Similar activities took place in other parts of Finland, such as in the city of Turku where more Kurdish residents partook in the protests. In this gathering, the Yarsan democratic organization, Communist Party of Iran (Komala), and PJAK spoke and pronounced their support for the prisoners and their condemnation of the Iranian regime. During the aggregation, Rauf Gulbadan and Abdulla Haji, the leader of PJAK in Europe read speeches and poetry to drive home the extreme conditions that the Kurdish prisoners were facing in Urmiya. Further protests took place in Helsinki, with two more further protests including one on December 21st in the Vantaa airport; with the second one held on December 23rd in front of the Iranian Embassy. The rounds of protests internationally started in Oslo, the capital of Norway on the 9th of December. In order to gain the greatest momentum and audiences, the demonstration occurred in front of the Norwegian Parliament. Representatives of the Free Life Party of Kurdistan (PJAK), as well as other prominent organizations such as the Kurdistan Independence Party, and the Movement for Arabic Freedom al-Ahwaz, Zagros Youth and other Kurdish youth organizations collectively condemned the treatment and abuse of the prisoners. Most importantly, the PJAK committee in Norway presented the head of the Parliament, and the Foreign Ministry of Norway with a detailed report outlining the inhumane and illegal treatment of the Kurdish political activists in Iran. Also to inform about the political prisoners, especially the Kurdish political prisoner circumstances which do on hunger strike, on December 11 and 12, PJAK published some written letters at midtown and international airport of Oslo. On 11th of December a similar protest occurred in London on the doorsteps of the Foreign Ministry of Great Britain. A number of political activists, civic organizations and parties participated in the event, including PJAK, the Kurdish cultural institutions in Manchester, and the Kurdistan National Congress (KNK) among others. The protesters denounced the violent policies of the Iranian regime towards Kurdish political prisoners and highlighted that the resistance of the activists in Urmiye served as a strong and symbolic act of defiance against the authoritarian regime. They resolved to inform and educate the British government as to the demands, needs and plight of the Kurdish political activists. Likewise, on 11th of December, the committee of PJAK arranged a peaceful demonstration on the steps of British Foreign Office in London. 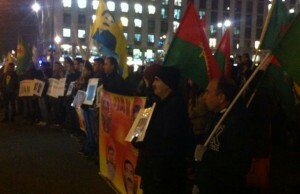 On the 23rd of December, the committee of PJAK held demonstrations in Cardiff with the Kurdish community. The protest also included meeting high level government officials and members of parliament in order to raise awareness and advocate for support and government condemnation of the treatment of the Kurdish activists in Urmiye. 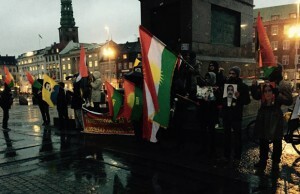 Protests likewise occurred in Copenhagen, the capital of Denmark by the Kurdish community in support of the Kurdish prisoner’s hunger strike and resistance against the Iranian regime. Representatives of all major political parties including PJAK, PYD, YNK and the Change Party presented a strong front against the violence being experienced by the political activists in Urmiye. The organizations not only denounced the genocidal policies of the Iranian regime towards minorities, particularly towards the Kurds, but also the silence of the international community and human rights organizations in this regard. Moreover, the PJAK committee in Denmark presented the Parliament with a detailed report of the ill treatment of the Iranian regime towards political prisoners in the hope of demanding a response, as well as raising awareness about the prisoners situation internationally. The committee of PJAK have sent written letters to the government officials in Aarhus city of Denmark, in the letters, the circumstances of the hunger striker in the prison and their health issues have mentioned. They also aware Denmark people and the Kurds who live their on this subject and asked them for helping Kurds hunger striker and warns Iran about the Kurdish political prisoners in central prison of Urmiye. 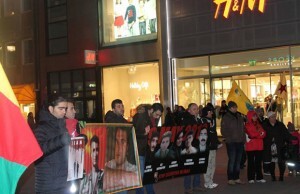 A protest against the policies of the Iranian regime also took place in Denhag in Netherlands, where representatives of PJAK, and the Kurdish Democratic Society gave speeches on the recent situation in Iran, with a particular focus on the Kurdish political prisoners in Urmiye. The protesters demanded immediate action and international condemnation by the Western states and human rights organizations. 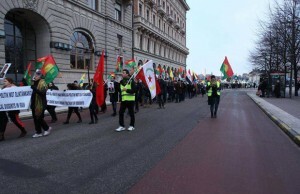 A demonstration was likewise organised by several Kurdish political parties, including PJAK, Ahwazi Arabs and civil society organizations based in Frankfurt in Germany, in support of the Kurdish political prisoners in Urmiye. In that gathering, representatives of PAJK Party and the Liberation of Arab Movement of Ahwaz condemned the Iranian regime for the inhumane treatment and oppressive policies against Kurdish people and other nationalities, especially the Kurdish political prisoners. They further demanded that the Rohani government fulfil their election promises and take action on minority rights and fulfil their obligations towards existing humanitarian issues. On the 12th of December, the PJAK committee held a protest involving hundreds of Kurds in Frankfort on the steps of the infamous Dom Church. In Sydney and Melbourne in Australia, Kurdish people also gathered to raise their voices in support of the legitimate demands of the Kurdish political prisoners in Urmiye. Similar to other protests internationally, the protesters in Australia also demanded that the Tehran government end the pressure on the political prisoners and stop its oppressive and violent policies towards the Kurds, Arabs, Azaris, Baloch and Turkoman communities. 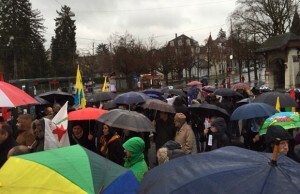 In addition, protests were held in Bern Switzerland on the 17th December to support the Kurdish hunger strike in prisoners, led by the PJAK committee. Hundreds of Kurds joined the event, and they collectively praised the Kurdish political prisoner’s resistance. Supporters, political parties and civil organizations demanded that Iran address the Kurdish political prisoner’s request as soon as possible. The participant also agreed to work together to raise awareness of the prisoners and to be their voice. 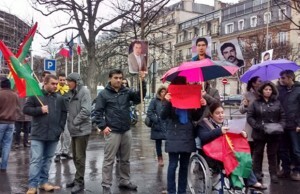 On December 19th, the Kurdish residents of Paris started a march and protest that ended in front of the Iranian Embassy. 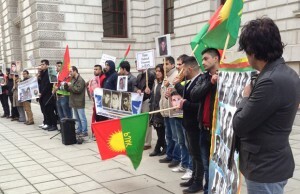 The protesters arrived at the embassy’s main entrance and defiantly raised the PJAK flag, as well as images of the Kurdish political prisoners pictures. The protesters condemned the Iran government’s anti-Kurdish policies and violations against minority groups such as the Kurds and their political prisoners. The protesters moved on to the centre of Lina, with the event ending with PJAK reading words of support for the prisoners and condemnation of the Iranian regime’s oppressive policies. The committee of PJAK in Brussels also held a strongly attended protest in Luxembourg centre with the Kurdish community. The protestors raised images of the political prisoners on hunger striker; and was demanded that the international community and human rights organizations act immediately to secure a peaceful end to the hunger strike. 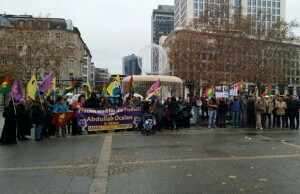 The Kurdish community of Austria, likewise, held a protest on December 15th in Carls Platzi. The participants condemned the inhumane policies of the Iranian regime with attending members of political parties including PJAK, PYD, the Arab Movement of al Ahwaz demanding that the government of Iran end its ill treatment of human rights activists immediately. Further, the protests demanded that the European Union break its silence on the treatment of political prisoners in Urmiye, and to act to end the hunger strike by pressuring the Iranian regime. Since these demonstrations, the Kurdish prisoners have successfully ended their hunger protest on the 22nd of December after 33 days of protesting, with the Iranian regime agreeing to their demands following collective international pressure. At the same time, the Free and Democratic Society of Eastern Kurdistan (KODAR) released a press release condemning the Iranian regime’s policies towards the Kurdish activists and encouraged the protestors to end their hunger strike in order to preserve the life of the prisoners. The Kurdish protests, as well as the actions of the Kurdish political parties in the diaspora demonstrated that collective action can, and does, play an important role in curbing repressive policies of authoritarian regimes and have a detrimental impact on humanitarian issues. Most importantly the demonstrations highlighted the unity of the Kurdish people in standing against violence occurring against Kurds in the four parts of Kurdistan.